There should be a new toggle where the map can be round which matches the rotating feature, rei's minimap had a feature where you could make the minimap round which makes the map rotate. please add a feature which can allow us to see the entirety of the discovered world. that would be amazing. 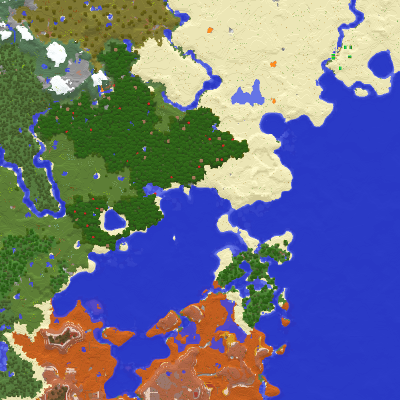 Check out my world map mod. The link is in the description on this page. Does the latest 1.13.2 version work with Rift? I know Forge has been updated to 1.13 but some of the mods I use, like Optifine, are not yet compatible with it, but are so with Rift. I'm just trying out Rift for the first time and with Optifine, Xaero's Minimap, and HWYLA in the Mods folder... Optifine seems to be the only one doing anything, for what it's worth? I may just have installed it incorrectly; I honestly don't know. No, it doesn't. Optifine will probably be updated soon though. Really liking your mod's aesthetics. I primarily use Journeymap as it has all the bells and whistles I crave, but playing some more recent FTB packs has exposed me to your minimap mod. Is there a way to automatically hide waypoints from other dimensions? This is a convenient feature I miss from Journeymap and was hoping I am overlooking an option to control this. The waypoints from other dimensions should be hidden by default. Does it not work this way for you? Been playing FTB:Interactions and my waypoints seem to persist when travelling between the void and overworld dimensions. Since I could find no settings or obvious labeling of dimensions on my waypoints, I assumed that it just wasn't able to do this. Perhaps it's something unique to this modpack. I tested the modpack and the void and overworld dimensions seem to be considered the same dimension in the code (at least on the client side). This explains why your waypoints persist. You can use the waypoint sets feature to create a separate set for each dimension. Really is amazing you took the time to load up the modpack just to confirm this. You're a superhero! Little bummed there isn't an easy fix for me though. Thanks for taking the time to investigate on your own! You're welcome. I think using the sets feature is actually a pretty easy fix. You can even set a key binding in the controls to switch between the sets quicker. Is there a way to disable your mod from talking to your website and setting cookies, even though update checking isn't enabled? It's also used to get the names of my patrons. Only the default cookies are set when the mod connects to the site anyway (if they even are). I'm not setting any cookies myself.